A small ceremony was held this week at Continental Motors Blue Marlin project in Mobile, AL to break ground on its Blue Marlin project. Many notable members of the community were represented at the groundbreaking ceremony. The speakers at the event included Rhett Ross (President and CEO of Continental Motors Group), Bob Chappelle (COO, Mobile Area Chamber of Commerce), Bob Smith (Senior Project Manager, Alabama Department of Commerce), Jerry Carl (Mobile County Commissioner), James Fowler (Board of Directors, Mobile Airport Authority), Philip Burton (President and CEO of Burton Property Group), and Jeff Berryhill (Principal of Stonemont Financial Group). Colliers International and CMG’s partner Clayco were also represented. 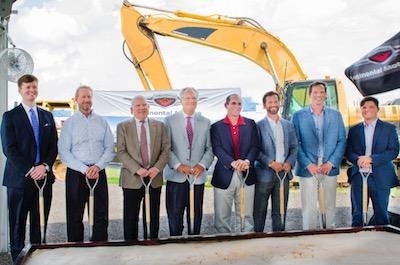 Continental Motors Group is building a greenfield manufacturing and office building in Mobile, Alabama — where CMG has based its operations for over 50 years, thus renewing its commitment to the local community and employees. Continental Motors Group is modernizing its infrastructure and enhancing its customer and technical support service capabilities around the world, allowing the teams to provide 24/7 support and assistance in the near future. The facility will encompass 275,000 square feet (25,000 m2) and the Blue Marlin project in its globality represents a $75 million investment back into the Mobile region and team at CMG. Upon completion, the factory will be populated with new, state-of-the-art manufacturing equipment and include a special area designated for evaluation of new manufacturing techniques and processes, including additive manufacturing and automation. The factory is set to be completed and in operation 2020.